Any animal compelled to lap up toilet water probably has a cast-iron constitution, right? So what harm can come to a dog who drinks out of natural bodies of water? Outdoor water sources can harbor organisms and chemicals that can be harmful to your dog, some of which can put you at risk for zoonotic disease as well. Bacteria. Water that’s contaminated with animal or human waste can contain bacteria, including species of salmonella, Campylobacter, Escherichia coli and Leptospira . In mild cases, these bacterial infections can lead to diarrhea (which could make for a long drive home from the beach, even with the car windows rolled down). Severe infections with these organisms can be much worse. Some of these bacteria may be shed in the stools of infected dogs, and improper handling of feces can potentially lead to infections in people. Of these bacteria, infection with the Leptospira species can be especially concerning. These bacteria are often found in marshy or muddy water and slow-moving or stagnant pools frequented by wildlife, such as raccoons, opossums, skunks and rodents. Infection in dogs, if not treated early, can result in liver and/or kidney damage and death. Organisms can be shed in the urine of infected dogs, leading to potential infection in people. If you live in an at-risk area or like to take your dog hunting, ask your veterinarian about leptospirosis vaccines. Although these vaccines can’t offer protection against every subtype of these bacteria, they do help protect dogs against some of the more common ones. Blue-green algae. Though not exactly a plant, these bacteria produce energy by photosynthesis. Cyanobacteria can form colonies of blooms that often float on the water’s surface, especially during the hot weather of summer and early fall. Dogs may swallow the blooms while swimming or ingest them when grooming their coats after being in the water. Some of these blooms produce toxins, such as microcystins, which can lead to liver failure, and anatoxins, which typically affect the nervous system. Signs can begin soon after ingestion and may include vomiting, diarrhea, seizures, collapse and death. If you suspect that your dog has swallowed blue-green algae, it’s important to get him to the veterinarian immediately. No antidote for the toxins exists, but supportive care may help your dog survive. Parasites. Outdoor water sources are also sources for parasites, including species of the protozoans Giardia and cryptosporidium. 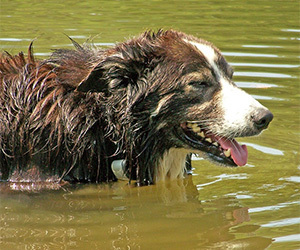 If your dog gets diarrhea after a day on the water, one of these may be the culprit. Chances are, these parasites won’t be spread to humans, but there is a slight risk for those who are immunocompromised. Chemicals. Outdoor bodies of water can not only contain surface runoff from surrounding lands, such as pesticides and herbicides, but other chemicals like gasoline and oil from boaters. Salt. Consuming a little bit of ocean salt water probably won’t hurt your dog, but large amounts of it can lead to dehydration and electrolyte imbalances. Dogs drinking ocean water may also experience diarrhea. When heading into the great outdoors with your dog, always pack a portable bowl and plenty of fresh water. If you notice your dog trying to drink out of a river or lake (or the ocean), lead him to his water bowl. In cases where the water smells or looks dirty (as enticing as that is for most dogs), it might be better to keep him on shore. And if your dog doesn’t seem like himself after a day on the river, lake or beach, take him to your veterinarian, just to be sure. And remember: If you wouldn’t drink the water, it’s probably not safe for your dog to drink either.